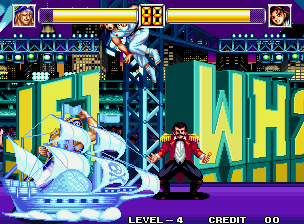 World Heroes 2 Jet © 1994 SNK. This update of World Heroes 2 introduces two new characters, Ryofu and Jack and 2 new modes of play - the Tournament and the Forging of Warriors. Developed by ADK. ADK's name is 'Alpha Denshi Kikaku'. Jack the Ripper is based on the real Jack the Ripper, who brutally murdered and mutilated five prostitutes in London in 1888. Ryofu is based on the real Lu Bu Fengxian, one of the famous warrior of the Three Kingdoms period. Ending 1 - Beat Zeus in 'Tournament Mode' in the second or third round with 25% of remaining energy or less in your character's lifebar. Ending 2 - Beat Zeus in 'Tournament Mode' in the second or third round with 75% of remaining energy in your character's lifebar. Ending 3 - Get a 'Perfect' against Zeus in 'Tournament Mode' in the second or third round (This is the true ending, since the developer's credits will appear only in this one!). Ending 4 - Defeat 4 opponents in 'The Forging of Warriors Mode' to see this ending. * Alternate costume Colors : Press B or C when selecting a character.